What is this? Among other things, it is a semiotic system that structures and defines subjectivity, experience, and agency. If we read what we may call the “mandala situation” by means of the heuristic of semiotic theory, we can see the structures of this situation at work. As a semiotic, that is to say, a signifying entity, the mandala, like all instances of signification, entails, enacts, is predicated upon the three-fold structure of signification: a sender of a “message,” the message itself, and a recipient of the message. What does such an analysis show us? Mandalas contain both narrative and synchronic elements. Narratives tell stories about gods, Buddhas, celestial battles, and so forth. They are meant to be exemplary; they speak of static, universal truths. These “higher” truths are often conveyed in a synchronic system of symbols which are often believed to have mystical properties in and of themselves. The layer of meaning in mandalas is, in fact, quite extraordinary. The individual recipient is thus overmatched by the complexity of the mandala’s structure and the power of the tradition/s which lay behind it. One must also add that the recipient’s “being” is dramatically expanded and empowered by participation in this body of semiotica which pre-exists every individual participant/recipient. In a FaceBook conversation on this topic Peter Sloan, a Philosophy graduate of the University of Alabama suggested the following: “but the ending of the ritual–the blowing away of the sand and the months of work–seems to suggest a profound lack of agency/authorship over our subjective experience, no?” Yes, Peter, by maybe not in the sense you mean. 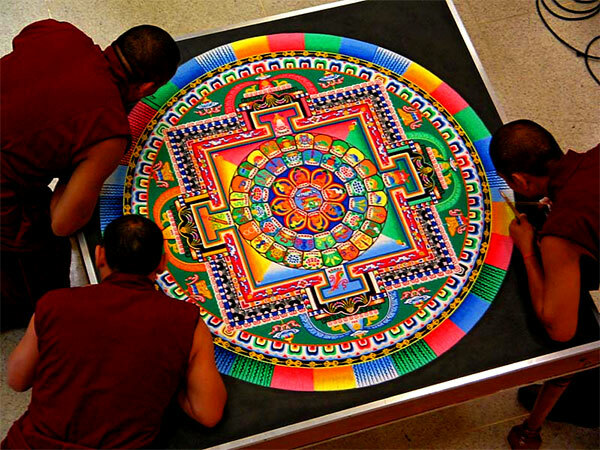 The destruction of the mandala is a means of conveying a normative narrative containing an alleged universal truth. It directs the recipient to see the current moment of their life in terms of the end of their life. It universalizes this to “all things.” That is to say, it carves out of the plethora of facts about life a few elements and organizes these around the issue of “impermanence.” This seems obvious, but that is precisely the point: to make the choices carved out by the specificity of the narrative and symbols appear to be simply the “nature of things,” i.e., just the way the world is. We could, of course, choose otherwise and make other elements of existence central. The agency of the mandala is asserted vigorously in and by its own structures of meaning by its simple indicative: “all things are impermanent.” It defines reality as a whole, itself an act of power and it positions the recipient by means of its subtle insistence that acceptance, even submission, to this “obvious” indicative statement is an existential necessity. It has agency; “we” participate in its agency, which means that we are subjected to it; we are subjects by means of it. As such, just as Peter says, the mandala directs “our” subjective experience: it constitutes it under the aegis of a specific order of meaning. Although the language is not correct, we could say the mandala imposes subjectivity and the structure of our subjective experience upon the recipient. As other, as “outside,” subjectivity therefore seems like a heteronomous thing, and so in terms of my supposedly autonomous “self,” there is a “profound lack of agency/authorship.” The mandala, and all that lay behind it, is what forms the structure/s of our subjectivity, of which agency is a reflex. This entry was posted in Tim Murphy and tagged agency, mandalas, self, Semiotics, subjectivity, Tibetan Buddhism. Bookmark the permalink.